The famous Sewer Key from Broken Sword 1 makes a welcome appearance in the second mission. 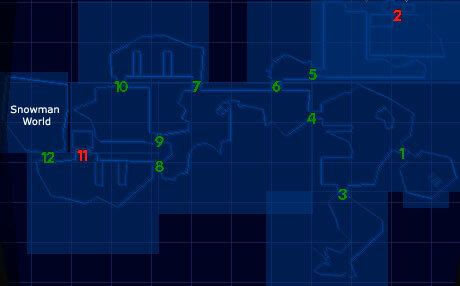 In mission eight and nine of the game, you're located on Nagarov's Island Base. This base has various levels, one being the security level. On this level you have the ability to lock and unlock the doors, in order to trick the robots. If you unlock door number 12 (the one beside the lift to the docks) - you enter an area called Snowman World! Strange Easter Egg, but fun none-the-less.